GSM termination in Lithuania is a profitable business, because of large flows of international traffic here, due to the high level of emigration. Although the average rate is small, with proper selection of the tariff plan for outgoing calls, you can earn at least $50 from each gateway channel here. 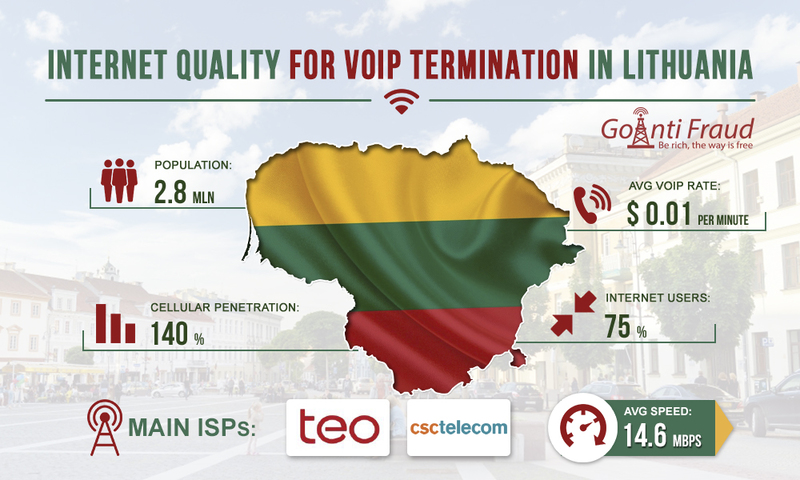 However, is the Internet good enough for effective performance of equipment for termination in Lithuania? To date, the Lithuanian telecommunications market is considered one of the most developed in Europe. The fixed line sector is declining as everyone is switching to mobile communication. Due to this, the mobile market is booming. The leader of the cellular communications sector in Lithuania is the operator named Telia. In parallel, it is the main Internet provider in the country. Another major broadband service provider is CSC TELECOM. Broadband Internet penetration in Lithuania has reached 75%. At the same time, the cable communication segment is small in the country and the DSL market is in decline. This is due to the fact that many subscribers are switching to fiber-optic Internet. At the moment, the government and telecommunications companies in Lithuania are investing in fiber-optic networks, focusing on high data transfer rates - gigabytes. Most new broadband Internet connections in the country are fiber-optic. Such an Internet is ideal for the operation of voip gateway termination, because it is considered the most stable and at the same time has a high speed. At the same time, the average Internet speed in Lithuania is 14.6 Mbit/s, which is also a high figure.